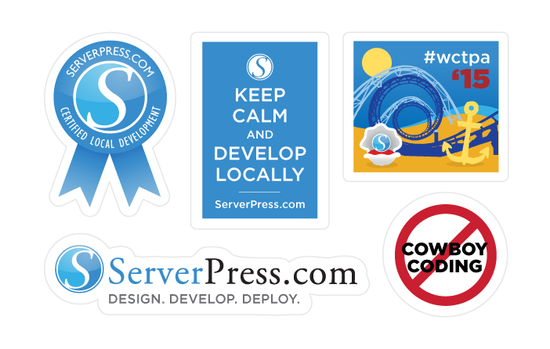 September 2015 Newsletter: You Could Win A Free Year of DesktopServer Premium! • ServerPress, LLC. Home » News » News » September 2015 Newsletter: You Could Win A Free Year of DesktopServer Premium! First Up: OSTraining + YouTube + DesktopServer = WOWZERS! This week we enjoyed an exciting call with Nancy Lucas from OSTraining. If you’re familiar, you know that OSTraining has a series of teaching videos about DesktopServer taught by Topher DeRosia (yes – the one and only HeroPress Topher) Well – check this out: OSTraining released all 14 of the DesktopServer Training Videos on YouTube this month. Nancy called to let us know they are available for the DesktopServer community and she hopes they help a lot of people break their Cowboy Coding habits. If you have about an hour, and a copy of DesktopServer Limited or Premium, and you want to get a very good overview and understanding of how the software works – head over to YouTube and follow along. We are genuinely grateful for these videos being available to the masses. Within our very small team, creating tutorials hangs over us like a nagging honey-do list. We know we really need to get it done, but there’s only so many hours in a day. To celebrate OSTraining’s generosity, we’ve released a 20% off coupon code for that will be good for 12 months. While it’s our standard 20% off DesktopServer Premium, it’s good for the general public and will last for 12 months. If you haven’t upgraded to DesktopServer Premium, maybe between the 20% off coupon and the training videos, you’ll be ready to make the jump. If not today, just save the coupon code and upgrade when you’re ready. Check out this WPElevation Podcast for a Chance to Win a 1 Year Membership to DesktopServer Premium! Earlier this month our good friend, Sarah Pressler, was interviewed by Troy Dean on his WPElevation podcast. While we didn’t sponsor that particular episode, we did donate a prize for Sarah to give away. The trick here is you have to listen to the whole podcast and answer a very unique question, leaving your answer in the comments section on Troy’s WPElevation Blog. We think you’ll enjoy the podcast and we can’t wait to award a winner. Even if you’re a current Premium customer, you can still participate and if you win, we will simply extend your membership out 12 additional months. So hop over,listen to the podcast (and hang in there, the opening is quite….interesting…) and best of luck to you all! Also – many thanks to Troy and Sarah for featuring our product on the podcast. We are honored to be included. 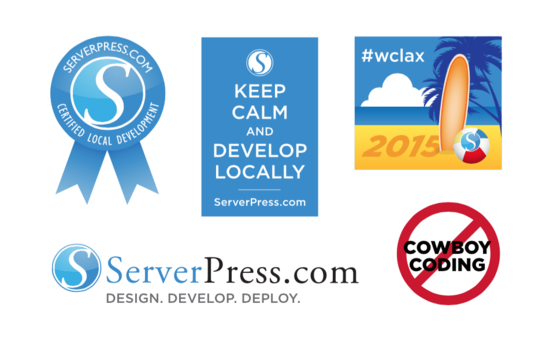 We are gearing up to head off to WordCamp Los Angeles and WordCamp Tampa next weekend. We’ve been switching things up with swag this year and wanted to bring something unique to both events. We reached out to the über talented Michelle Schulp & she helped us design new stickers for each event. We LOVE them. Now this isn’t an East Coast v. West Coast thing so no arguing over which one is cooler than the other. But if you happen to be at either event this next weekend feel free to stop by the booth and grab some of these limited edition stickers. Gregg will be in LA and Marc will be in Tampa. Sarah Pressler is heading out to speak at LA and we’ve invited her to hang out at the swag table in with Gregg. Stop by and say hello. Take a selfie with the gang (yes…she’s bringing a selfie stick)! We’ll be uploading the photos to Instagram, Twitter, Facebook, Google+, and maybe even our Pinterest board. If you’re in Tampa swing by the booth and snap a photo with Marc. We will be missing him in LA. Are You Speaking at WordCamp This Fall? Why not try our Free WP_Presenter Theme? If you have spoken at WordCamps in the past, you know how stressful it can be when you get up on stage and discover that the wifi connection is so slow your self-hosted presentation is having trouble doing it’s job. Does anyone else find it ironic that tech events always have bad wifi? Well we decided we needed a solution. We asked our good friend, Trisha Salas, to help us build a theme so that you can present at your WordCamps using a local WordPress installation. (Naturally we recommend using DesktopServer, but you could use any local setup. )Built using reveal.js, WP Presenter showcases the versatility of WordPress – it’s more than “just a blog!” WP Presenter was created specifically to allow presentations to be built and presented from within a local WordPress environment, eliminating the need for a wifi connection at WordCamps. There are many functionalities and customization options present and the testing phase needs more eyes than just the few people who have helped pull this together. We are aware of certain bugs and are working to resolve them; however, we are welcoming the public to download, install and utilize this theme at your convenience. 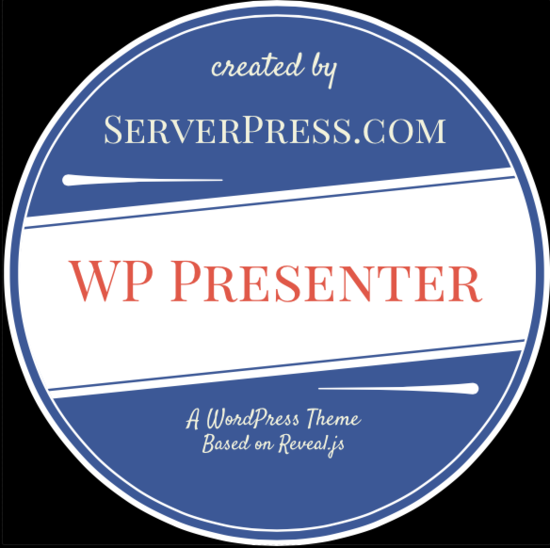 Most recently Marc Benzakein used WPPresenter when he spoke at WordCamp Kansas City this past summer. You can check it out on GitHub and please let us know if you use it for a WordCamp presentation. We would love to showcase your presentation on newly created WP_Presenter Pinterest Board. If you have been following along with Marc’s journey from two kids to five kids to nine kids overnight, you know he’s had his hands full this summer. 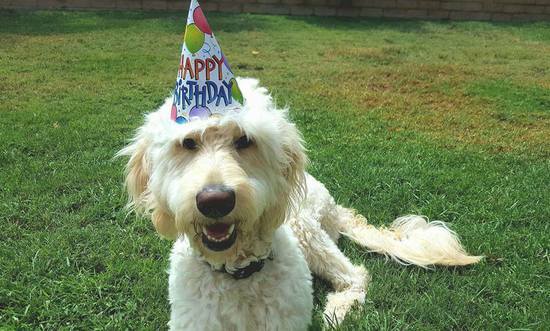 Steve’s family has also grown, Gregg’s sweet puppy Professor Tucker, turned one – and the ServerPress family grew as well. We will have some exciting announcements next week so stay tuned to your inboxes. If you want to follow along with Marc’s family’s journey you can watch this recent interview Marc and Jessica gave to Carrie Dils on her podcast. In The Business of Family, Marc and Jessica share their story with us. It’s inspirational and we are so proud to have Marc on the ServerPress team. We love hearing back from our community members so much so that we keep a running list of ServerPress Props on our website. We’ve recently updated with testimonials from Jackie D’Elia, Keith Banger, and Josh Pollock. And we would love to hear from you. If you feel so inclined, head over to the Testimonials page on our website, scroll to the bottom, and pop in a note. You never know – you might be featured in our next newsletter when we revamp our Customer Testimonials section in the footer. Check out Topher’s DesktopServer OSTraining videos on YouTube. Snag the OST20 coupon code and use it now or save it for later. It’s good for 1 full year from today. Go listen to that WPElevation podcast and enter to win the free year of DesktopServer Premium. Stop by the booths at WCLAX or WCTPA and pick up some stickers, take a selfie, and share on line using the official hashtags. 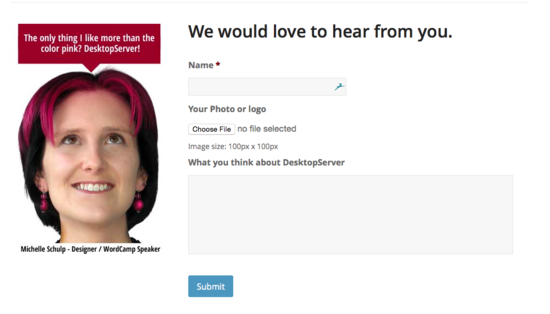 Download, use, fork, send feedback on our WP_Presenter theme. Check out what Marc and Jessica have been up to all summer via Marc’s blog and the OfficeHours.fm podcast. 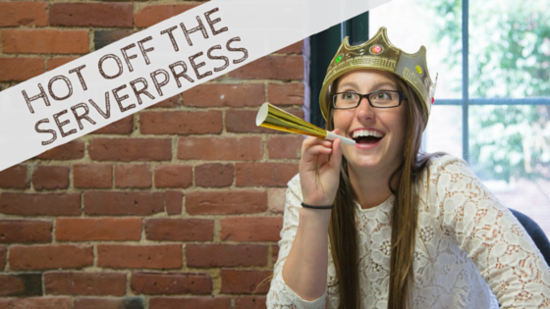 Don’t forget to watch your inboxes next week for some exciting ServerPress Family News. And send us a testimonial! Thanks for being the most important part of why we do what we do. We love our community members and hope you’ve enjoyed this month’s email. We hope to see you all real soon at a WordCamp or Meetup. And don’t forget to catch up with us on Twitteror Facebook. 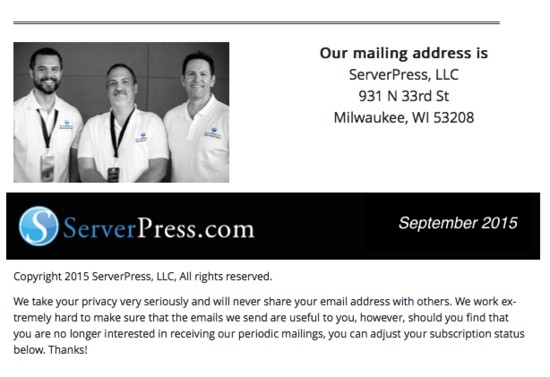 To make sure you keep getting these emails, please add admin@serverpress.com to your address book or whitelist us. Want out of the loop? Unsubscribe. previous post: Check Out the New DesktopServer Documentation Center!